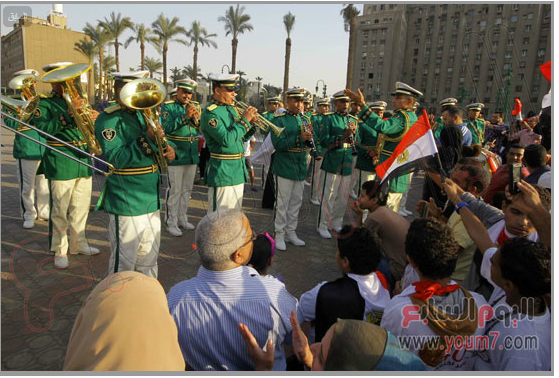 Egyptians celebrate today, the 40 anniversary of the remembrance of 6 October War victory 1973. Muslim Brotherhood threatened Egyptians who are going to celebrate that occasion. They announced that today is the end of anyone and everyone who participated in getting the Brotherhood regime down and isolated Mohamed Morsi. Muslim Brotherhood threatened through their social media accounts on Facebook, Twitter and Official Sites, and Aljazeera Qatarian Channel, that this day will be reprisals against anyone who will descend to celebrate this anniversary and threatened to attack public and private properties. Muslim Brotherhood are using Al- Jazeera Qatarian news agency as usual, in forging news, videos and images. The Brotherhood supporters will get into the crowds who will celebrate the occasion, and at a certain time, they will raise their yellow four fingers slogans “Rabaa slogan” in order to broadcast forged scenes, to make it look to the foreign international medias, like that mass celebrating, are the brotherhood supporters, due to their utter failure in mobilizing any demonstrations since the 14th of August 2013. Brotherhood supporters and some of Al-Jazeera crew, are going to wear fake military uniform of the Egyptian army and film fake scenes, to make it look like the Egyptian military are attacking Brotherhood demonstrators. This happened on the 4th of September 2013 and the Police is looking for those who committed that crime, based on an official statement made at DA office from the eyewitnesses. We are warning International News Agencies that convey scenes which aired by Aljazeera, International news agencies must be careful in getting involved in airing fake news spread by Aljazeera. All the events of the celebrations today will be aired by all the public and private news agencies and it will be observed and filmed by International and local Human Rights Organizations to expose any Muslim Brotherhood violations to spoil that celebration day. In case of publishing any fake news, we will make sure to expose all the news agencies who will spread fake news to their audience. Egyptian had enough from International news medias spreading fake news about what is really happening in Egypt, still there are some international news spreading fake news to their audience by making them believe that what is happening in Egypt is that Egyptians are divided. That’s not true, Egyptians are not divided, Egyptians are united and fighting an international terrorists Organisation called Muslim Brotherhood and we are doing well in ending their terror attacks against innocent people.